The Gates Commission on an All-Volunteer Armed Force, made possible by the works and recommendations of Martin Anderson and Milton Friedman. In April of 1967, Martin Anderson, who served as the research director for the Nixon Campaign of 1968, would go on to write a memorandum urging the future President to take on the task of implementing an all-volunteer force as part of his future administration. The memorandum was written in the form of a brief outline for Nixon to take into consideration. Nixon was drawn to the idea, and encouraged Anderson to look further into the subject to provide him with a more elaborate analysis. The paper that Anderson would go on to write, “An Analysis of the Factors Involved in Moving to an All-Volunteer Armed Force,” would be the determining factor for RN’s presidential stance. On November 17, 1967, seven months after receiving Anderson’s outline, RN went on to make his first public statement regarding an all-volunteer force. His audience of choice was the Student Bar Association of the University of Wisconsin. A New York Times article published the day after his talk quoted RN as saying in response to a student’s question regarding the merits of a selective service system, “what is needed is not a broad-based draft but a professional military corps…” He suggested that the country “move toward a volunteer army by compensating those who go into the military on a basis comparable to those in civilian careers”. In an era of politically active college students, the article highlighted that “…his audience was attentive [and] polite” when considering just one week prior, Governor Romney, another potential Republican candidate in 1968, was disturbed by hecklers in his speech to students at the University of Wisconsin. The issue of ending the draft would be a cornerstone of Nixon’s campaign in 1968. 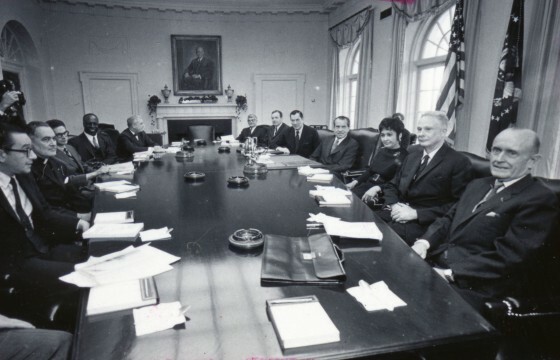 With the assistance and intellectual groundings of many passionate individuals such as Martin Anderson and Milton Friedman, RN acquired the foundation for which ending the draft would become a likely possibility in his administration. More importantly, in taking such a stance, RN addressed a problem that was plaguing the youth of America by offering a solution to help heal a nation suffering from the horrors of war in Vietnam.